Yarn: Cascade 220 and Patons Classic Wool (stashed odds and ends, unknown colors), 3 oz. total. This was great fun and a nice rest for my hands after the million tiny stitches. It’s a great way to use up random stashed colors, that’s for sure! I had a great time laying out balls of worsted weight in rows and choosing the loudest combination I could wear. I’m very surprised that the braided edge gives enough structure to keep the edge from rolling, but it really does. It certainly gives a cleaner silhouette than a hem does. The only change I made to the pattern was adding those little blips of purple in the center of each design. They’re duplicate stitch. As you can see, this hat’s a little tall- 20″ from edge to edge, over the top. Since I prefer a shorter hat, I’m already making another one. I hesitated the first time around, but think I’ve hit upon the loudest color combination I’ll wear with this one! I’m wangling the pattern a bit, adding a second braid, extending the striped section a bit, and taking out nearly a full repeat of the pattern. Will report back. 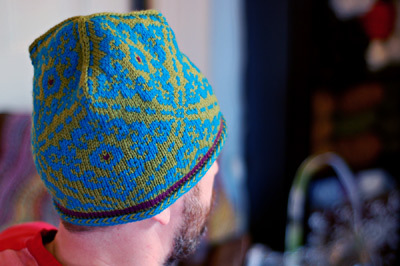 In the meantime, look at all the Ingas on Ravelry, or check those puppies out on Flickr. There are some excellent color combos out there, for sure! I kept these under wraps on the blog because I didn’t want my mom to see them before she got them, but now I can show what is one of my most favorite projects to date. My interest in using yarn that had a halo for stranded colorwork was rekindled after knitting the Fantom Bohus, which has such lovely, feathered color transitions. The patterning in these is much more graphic, but the halo softens everything just enough to keep things from being stark. Also, mohair= strong, which is a great thing for mittens. 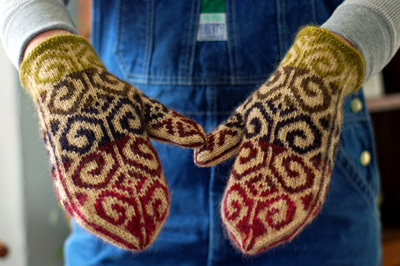 I dyed the yarn for these ages ago, with some kind of mitten in mind. The yarn was hot pour dyed* in nearly solid colors with acid dyes. Despite dyeing what I thought was far too much lining yarn, I ran out and had to have a mismatched thumb. The horror! The chart is my own, but no doubt influenced by various sources, including Turkish socks. Spirals are good. We can never have enough spirals, is my motto. 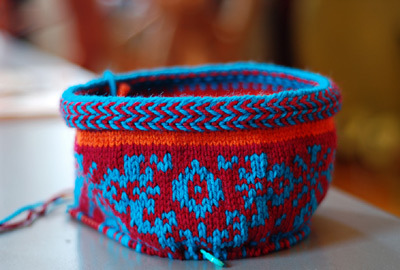 These are knit from the bottom up with the circumference about an inch bigger than the recipient’s palm measurement. I usually like mittens to be about 1/2″ larger in circumference than the palm, so the extra 1/2″ of space is needed for a lining. Stitches for lining were picked up in the cashmere at the inside edge, decreased a bit, and a second mitten was knit. This second mitten can be popped right inside the first. They are unbelievably cozy. The thumb has a side seam gusset (sore thumb), which is great for not disrupting the patterning, and also allows the back and palm of the mitten to be identical. There’s no right or left mitten, which helps to ensure even wear. I used an i-cord cast on for the mitten edge. It’s a lovely edge, but be warned- it wasn’t enough to prevent curling (as seen in the progress photos above) without the lining added. I love these so much that I’m planning to sell them as a kit, with pattern and dyed yarn. These will be test knit in various simple and complex color combinations and sizes. I’ll keep you updated. The lining won’t be cashmere for the kits, due to the problems associated with producing it. The cashmere I used for these was bought ages ago, before I knew of these problems, and I’ll work my way through it and that’ll be it for cashmere for me, unless I come across American cashmere yarn. My yarn is from ColourMart, which sells mill ends, so it’s a less destructive way to get cashmere, but I’m cool with not using the fiber at all, myself, and don’t want to sell it. I’m testing alpaca for the lining right now. I think it will be plenty scrumptious. I hope everyone got awesome presents. (Of course, we all gave awesome presents, right?) I know I was treated like royalty this year, receiving all three seasons of Deadwood and the first two of Buffy- excellent knitting entertainment- as well as all kinds of other treats. There are two containers of hot chocolate mix left over. Who’s thirsty and cold? *There are excellent instructions in The Twisted Sister Sock Workbook, by Lynne Vogel. 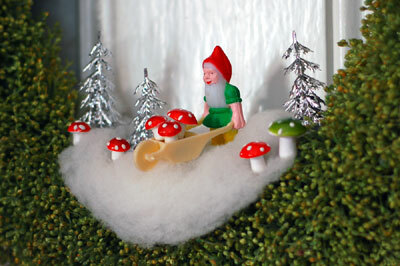 Oh, mushroom farmer gnome, how I love you! These wreaths were my non-knitting Christmas craft of the year, and since they’ve been received by friends already I can show them, because there have got to be more gnome/toadstool freaks out there who’ll love this. The gnomes and trees are from A. Bell Emporium. Amanda’s AWESOME. Vintage spun cotton mushrooms from D. BlÃ¼mchen & Company. This website has so much good stuff, I freak out a little. 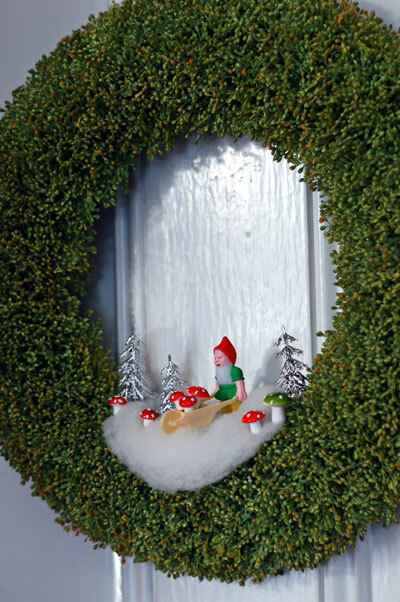 I got my wreaths from Save-On-Crafts.com, but I suspect big craft stores would have them. The snow is wool, of course! Somehow, between finishing up the fiber club and Christmas, I have to make my usual hot chocolate mix (This is a new recipe, so no word on how good it is. I did make the vanilla sugar and we can’t stop putting it in our coffee, so I’ll have to make more. UPDATE: The hot chocolate is excellent- kind of Swiss Miss-y in a happy, cheesy way, but with the yummy vanilla flavor added. ), marshmallows, and toffee, plus Parmesan Black Pepper biscotti. I’m totally making recipes I haven’t tried before to give away to people I like. I’m brave bonkers like that. It’s comforting to look back and realize I was this mental last year, as well, because I survived! Your packages will ship right after Christmas.